Depleted uranium and its alloys are important engineering materials due to their high density. It is well known that depleted uranium can be alloyed to improve several elastic and plastic related properties, to enhance corrosion resistance, and to allow flexible heat treatability. In recent experiments performed at HPCAT, CDAC Steering Committee member Nenad Velisavljevic and co-workers from Los Alamos National Laboratory (LANL) using ultrasonic interferometry (Fig. 1) have determined the elastic, mechanical, and thermal properties of depleted uranium to 4.5 GPa. 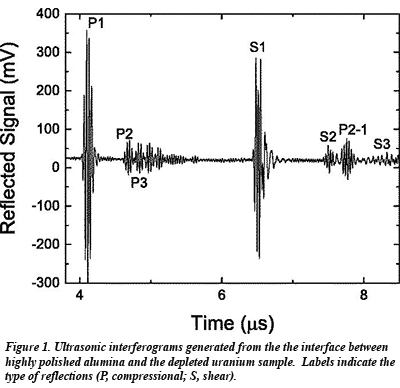 Combining x-ray radiography, x-ray diffraction, and ultrasonic interferometry techniques, the group has determined both a pressure–volume curve and sound velocities. Results show a general strengthening with applied load, including an overall increase in acoustic thermal conductivity. This is the first set of elastic/thermal results on uranium metal at high pressure, and this work has also demonstrated the capacity to make such measurements on radioactive and other potentially hazardous materials. These experiments were carried out using CDAC beam time allocated to LANL as part of CDAC's ongoing support of technical developments by the LANL group at each of HPCAT’s four beamlines, covering a wide range of material property measurements at extreme conditions [M. Jacobsen et al., J. Appl. Phys. 119, 165904 (2016)].